Basingstoke's only indoor soft playcentre for young children. We believe all days should be Playdays! Tuesday 2nd April 2019: 3pm closure & re-open at 4pm for our exclusive SEN event. Come and enjoy the pirate ship themed play equipment, with lots to do for your little ones. We have a 4 lane astro slide, ball pits, a bounce-bed, twist and straight tube slides all on a multi-level play frame. Parents can see nearly all the way through the play equipment to keep an eye on their little ones and we don't mind if the parents want to go on to help their children (we know you all want to a have a little play yourselves!). There are newspapers and magazines for you to relax with on one of the many sofas around Playdays. We have a busy restaurant offering a large selection of food with many options available for customers with food allergies. Playdays staff serve great coffees along with Playdays very own 'Deluxe Hot Chocolate' and the new 'Unicorn Hot Chocolate'. 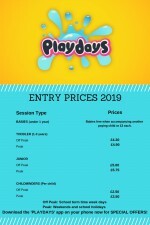 Playdays is open 9:30am - 6:30pm 7 days a week all year with the exception of Christmas Day & Boxing Day (reduced opening hours apply on Easter Sunday). We also host an Exclusive Special Needs event on the 1st Tuesday of each month & therefore close to the public at 3pm on these occassions. For more regular updates on events and activities please join our facebook page www.facebook.com/PlaydaysIndoorPlaycentre or dowload the 'Playdays App'. Please always call site if you are travelling from outside of the area to visit to ensure we are open. Any unexpected closures are always announced on our facebook page. No booking is required just turn up and pay to play. Best of all 2 adult carers are FREE with each paying child, All sessions are normally for unlimited play time, however we reserve the right in busier periods to reduce your play session at peak times, it is possible that we will operate our wristband system which will limit your session times to approx 2-3 hours. Height and age restrictions (to comply with public liability insurance) of 1.52m or 11 yrs old, which ever comes first apply at all times. Adults Two adults are free with every paying child then 50p fee per adult in the group. *babies are free if accompanying paying toddler or junior child, or £2 each if on their own. 2nd or more babies £2 each. We have various deals available to all our customers, just choose which is more suitable to you. Only one discount or promotion can be used at a time. These discounts only apply during off peak periods (school weekdays) and not at peak times (weekends/school holidays). Meal deals - Get a child entry and a meal all in one great price, Just pay on entry. Sorry cant be upgraded or exchanged at a later date. Only for use on the day of issue. Does not include drink. On production of your card get 50p discount per child off standard entry price. We hold exclusive SEN sessions on the 1st Tuesday of each month 4pm-6.30pm for £3.50 per child (siblings welcome). Please check our facebook page for upto date announcements as subject to change. Monday - Friday term time only £2.50 per child (on production of a valid/in date OFSTED registration certificate or NCMA card. We do still offer a childminder discount during school holidays but at a higher rate of £3.50 per child. There are no childminder discounts offered at weekends.